About two years ago I moved in to our place, pushed things around, fretted over all the things I would DIE to change (still doing that, by the way) and rolled my sleeves up on a project or two. One of the first endeavors was removing a glass-light-thingy from the bathroom ceiling fixture. I don't have a "before" shot. Just trust me. It was ugly. And I figured (a) it couldn't be any uglier if I removed it (b) by removing the glass-thingy I was forcing myself to actually upgrade really soon, and (c) maybe in the meantime it could pass as "industrial chic". But here's the thing: It ain't chic. It's a light bulb. And like so many other things, our eyes got used to it. The bare light bulb just sat there. But gosh-darn, it's time to make some changes around here. - Simple flush-mount ceiling light? It would do the job. It would be cheap. But it would also be boring. 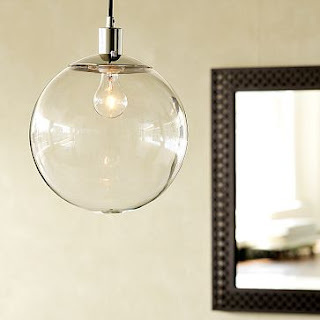 - How about a truly industrial light -- like these from West Elm? - Or push the envelope for our little bathroom, and install a plush chandelier? I think the chandelier wins. Our tiny bathroom can use the glam, and I can only imagine how hard it would be to keep the globe fixtures clean with all the hairspray flying around. I like hairspray, after all. I'll share the plans for one I purchased (including a new paint job) soon! When you do can I put you to work? I just installed it and it needs a dimmer. Haha!